Species which have been assessed for extinction risk are on average moving closer to extinction. Amphibians face the greatest risk and coral species aredeteriorating most rapidly in status. Nearly a quarter of plant species are estimated to be threatened with extinction. The existence of the 2010 biodiversity target has helped to stimulate important action to safeguard biodiversity, such as creating more protected areas (both on land and in coastal waters), the conservation of particular species, and initiatives to tackle some of the direct causes of ecosystem damage, such as pollution and alien species invasions. 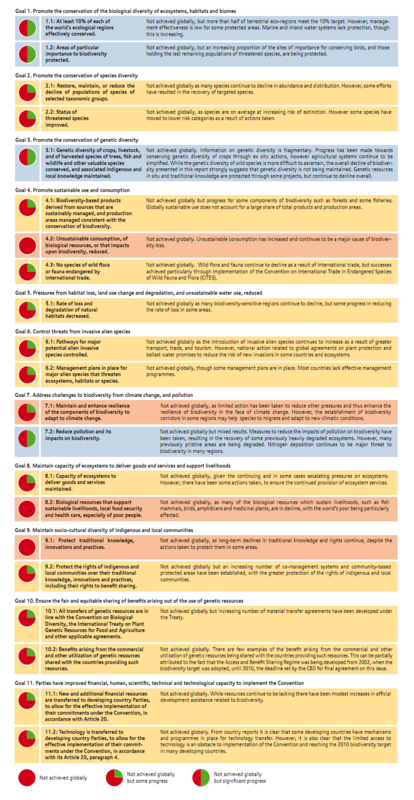 Some 170 countries now have national biodiversity strategies and action plans. At the international level, financial resources have been mobilized and progress has been made in developing mechanisms for research, monitoring and scientific assessment of biodiversity. Many actions in support of biodiversity have had significant and measurable results in particular areas and amongst targeted species and ecosystems. This suggests that with adequate resources and political will, the tools exist for loss of biodiversity to be reduced at wider scales. For example, recent government policies to curb deforestation have been followed by declining rates of forest loss in some tropical countries. Measures to control alien invasive species have helped a number of species to move to a lower extinction risk category. It has been estimated that at least 31 bird species (out of 9,800) would have become extinct in the past century, in the absence of conservation measures. However, action to implement the Convention on Biological Diversity has not been taken on a sufficient scale to address the pressures on biodiversity in most places. There has been insufficient integration of biodiversity issues into broader policies, strategies and programmes, and the underlying drivers of biodiversity loss have not been addressed significantly. Actions to promote the conservation and sustainable use of biodiversity receive a tiny fraction of funding compared to activities aimed at promoting infrastructure and industrial developments. Moreover, biodiversity considerations are often ignored when such developments are designed, and opportunities to plan in ways that minimize unnecessary negative impacts on biodiversity are missed. Actions to address the underlying drivers of biodiversity loss, including demographic, economic, technological, socio-political and cultural pressures, in meaningful ways, have also been limited. Tropical forests would continue to be cleared in favour of crops and pastures, and potentially for biofuel production. Climate change, the introduction of invasive alien species, pollution and dam construction would put further pressure on freshwater biodiversity and the services it underpins. Changes in the abundance and distribution of species may have serious consequences for human societies. The geographical distribution of species and vegetation types is projected to shift radically due to climate change, with ranges moving from hundreds to thousands of kilometres towards the poles by the end of the 21st century. Migration of marine species to cooler waters could make tropical oceans less diverse, while both boreal and temperate forests face widespread dieback at the southern end of their existing ranges, with impacts on fisheries, wood harvests, recreation opportunities and other services. The build-up of phosphates and nitrates from agricultural fertilizers and sewage effluent can shift freshwater lakes and other inland water ecosystems into a long-term, algaedominated (eutrophic) state. This could lead to declining fish availability with implications for food security in many developing countries. There will also be loss of recreation opportunities and tourism income, and in some cases health risks for people and livestock from toxic algal blooms. Similar, nitrogen-induced eutrophication phenomena in coastal environments lead to more oxygen-starved dead zones, with major economic losses resulting from reduced productivity of fisheries and decreased tourism revenues. There are greater opportunities than previously recognized to address the biodiversity crisis while contributing to other social objectives. For example, analyses conducted for this Outlook identified scenarios in which climate change is mitigated while maintaining and even expanding the current extent of forests and other natural ecosystems (avoiding additional habitat loss from the widespread deployment of biofuels). Other opportunities include "rewilding" abandoned farmland in some regions, and the restoration of river basins and other wetland ecosystems to enhance water supply, flood control and the removal of pollutants. Well-targeted policies focusing on critical areas, species and ecosystem services are essential to avoid the most dangerous impacts on people and societies. Preventing further human-induced biodiversity loss for the nearterm future will be extremely challenging, but biodiversity loss may be halted and in some aspects reversed in the longer term, if urgent, concerted and effective action is initiated now in support of an agreed long-term vision. Such action to conserve biodiversity and use its components sustainably will reap rich rewards - through better health, greater food security, less poverty and a greater capacity to cope with, and adapt to, environmental change. Placing greater priority on biodiversity is central to the success of development and poverty-alleviation measures. It is clear that continuing with "business as usual" will jeopardize the future of all human societies, and none more so than the poorest who depend directly on biodiversity for a particularly high proportion of their basic needs. The loss of biodiversity is frequently linked to the loss of cultural diversity, and has an especially high negative impact on indigenous communities. The linked challenges of biodiversity loss and climate change must be addressed by policymakers with equal priority and in close co-ordination, if the most severe impacts of each are to be avoided. Reducing the further loss of carbonstoring ecosystems such as tropical forests, salt marshes and peatlands will be a crucial step in limiting the build-up of greenhouse gases in the atmosphere. At the same time, reducing other pressures on ecosystems can increase their resilience, make them less vulnerable to those impacts of climate change which are already unavoidable, and allow them to continue to provide services to support people's livelihoods and help them adapt to climate change. Better protection of biodiversity should be seen as a prudent and cost-effective investment in risk-avoidance for the global community. The consequences of abrupt ecosystem changes on a large scale affect human security to such an extent, that it is rational to minimize the risk of triggering them - even if we are not clear about the precise probability that they will occur. Ecosystem degradation, and the consequent loss of ecosystem services, has been identified as one of the main sources of disaster risk. Investment in resilient and diverse ecosystems, able to withstand the multiple pressures they are subjected to, may be the best-value insurance policy yet devised. Scientific uncertainty surrounding the precise connections between biodiversity and human well-being, and the functioning of ecosystems, should not be used as an excuse for inaction. No one can predict with accuracy how close we are to ecosystem tipping points, and how much additional pressure might bring them about. What is known from past examples, however, is that once an ecosystem shifts to another state, it can be difficult or impossible to return it to the former conditions on which economies and patterns of settlement have been built for generations. Much greater efficiency in the use of land, energy, fresh water and materials to meet growing demand. Use of market incentives, and avoidance of perverse subsidies to minimize unsustainable resource use and wasteful consumption. Strategic planning in the use of land, inland waters and marine resources to reconcile development with conservation of biodiversity and the maintenance of multiple ecosystem services. While some actions may entail moderate costs or tradeoffs, the gains for biodiversity can be large in comparison. Communication, education and awarenessraising to ensure that as far as possible, everyone understands the value of biodiversity and what steps they can take to protect it, including through changes in personal consumption and behaviour. Urgent action is needed to reduce the direct drivers of biodiversity loss. The application of best practices in agriculture, sustainable forest management and sustainable fisheries should become standard practice, and approaches aimed at optimizing multiple ecosystem services instead of maximizing a single one should be promoted. In many cases, multiple drivers are combining to cause biodiversity loss and degradation of ecosystems. Sometimes, it may be more effective to concentrate urgent action on reducing those drivers most responsive to policy changes. This will reduce the pressures on biodiversity and protect its value for human societies in the short to medium-term, while the more intractable drivers are addressed over a longer time-scale. For example the resilience of coral reefs - and their ability to withstand and adapt to coral bleaching and ocean acidification - can be enhanced by reducing overfishing, land-based pollution and physical damage. Direct action to conserve biodiversity must be continued, targeting vulnerable as well as culturally-valued species and ecosystems, combined with steps to safeguard key ecosystem services, particularly those of importance to the poor. Activities could focus on the conservation of species threatened with extinction, those harvested for commercial purposes, or species of cultural significance. They should also ensure the protection of functional ecological groups - that is, groups of species that collectively perform particular, essential roles within ecosystems, such as pollination, control of herbivore numbers by top predators, cycling of nutrients and soil formation. Increasingly, restoration of terrestrial, inland water and marine ecosystems will be needed to re-establish ecosystem functioning and the provision of valuable services. Economic analysis shows that ecosystem restoration can give good economic rates of return. However the biodiversity and associated services of restored ecosystems usually remain below the levels of natural ecosystems. This reinforces the argument that, where possible, avoiding degradation through conservation is preferable (and even more cost-effective) than restoration after the event. Better decisions for biodiversity must be made at all levels and in all sectors, in particular the major economic sectors, and government has a key enabling role to play. National programmes or legislation can be crucial in creating a favourable environment to support effective "bottom-up" initiatives led by communities, local authorities, or businesses. This also includes empowering indigenous peoples and local communities to take responsibility for biodiversity management and decision-making; and developing systems to ensure that the benefits arising from access to genetic resources are equitably shared. We can no longer see the continued loss of and changes to biodiversity as an issue separate from the core concerns of society: to tackle poverty, to improve the health, prosperity and security of our populations, and to deal with climate change. Each of those objectives is undermined by current trends in the state of our ecosystems, and each will be greatly strengthened if we correctly value the role of biodiversity in supporting the shared priorities of the international community. Achieving this will involve placing biodiversity in the mainstream of decision-making in government, the private sector, and other institutions from the local to international scales. The action taken over the next decade or two, and the direction charted under the Convention on Biological Diversity, will determine whether the relatively stable environmental conditions on which human civilization has depended for the past 10,000 years will continue beyond this century. If we fail to use this opportunity, many ecosystems on the planet will move into new, unprecedented states in which the capacity to provide for the needs of present and future generations is highly uncertain.